Pure, Unpasteurized and Alive with Enzymes, Vitamins, Minerals that are naturally found in honey in its raw state. Highest possible levels of live enzymes, vitamins, minerals, antioxidants, and healing agents as a functional food Prebiotic Properties: Helps promote the growth and activity of bifidobacteria. Direct and fresh from the Hive!! 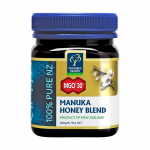 Amazing taste and full flavour... very different to supermarket honey Unprocessed, raw state provides maximum level of natural antioxidants and full beneficial factors as a functional whole food.